The Lake Ray Roberts Sportsman's Association is an organization of individuals and businesses working together to monitor, protect, and improve the high quality sport fishery and wildlife environment of Lake Ray Roberts, Texas. This organization is formed as a non-profit entity to provide its members a voice and participatory opportunity with the public and authorities in manners concerning the recreational consumers of Lake Ray Roberts, Texas. The Lake Ray Roberts Sportsman's Association recently completed a creel survey on Lake Ray Roberts for the TPWD. This was the first ever scientific study done for the department using only volunteers. 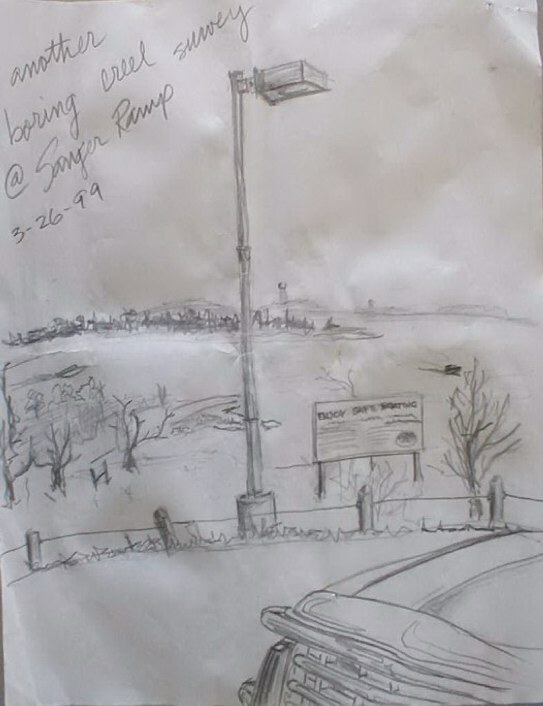 RRSA President Pete Hollar did this sketch on a slow creel survey day.